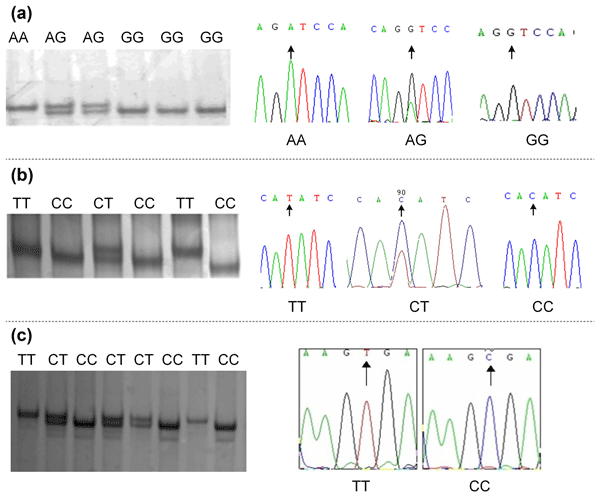 The impact of polymorphisms of the calpain 1 (CAPN1), calpastatin (CAST), leptin (LEP) and growth hormone receptor (GHR) on carcass characteristics and meat quality traits in 400 purebred Holstein bulls was examined using polymerase chain reaction and restriction fragment length polymorphism method. In the current study, the CAPN1, CAST and GHR genotypes confirmed significant associations with important traits in adequate numbers of animals. The present study was based on the association of polymorphisms at LEP, CAST, CAPN1, GHR, FABP4 and DGAT1 genes with fattening performance and carcass traits in Simmental bulls. Results indicated that final weight, fattening period, total weight gain and average daily gain differentiated the CAST and CAPN1 marker genotypes. Moreover, a novel effect of the LEP A80V on carcass weight and dressing percentage was observed. The results could be indicative for future studies on beef production. This study aims to investigate the screening of leptin genetic polymorphism and its effect on lameness prevalence. Prevalence of lameness was evaluated and results showed that genotypes and other factors included in the logistic regression model significantly affect the prevalence of lameness in Holstein cows (P < 0.01). The probability of lameness incidence varied between 37 % and 99 % with parity. This recorded incidence is greater in winter and autumn than in the summer and spring. Effects of miRNA polymorphisms on phenotypic traits have been studied in several species but much less in cattle. We tested the association between polymorphisms of bta-miR-2313 and growth and carcass traits in the Slovenian Simmental cattle breed and developed an atlas of miRNA regulatory elements. 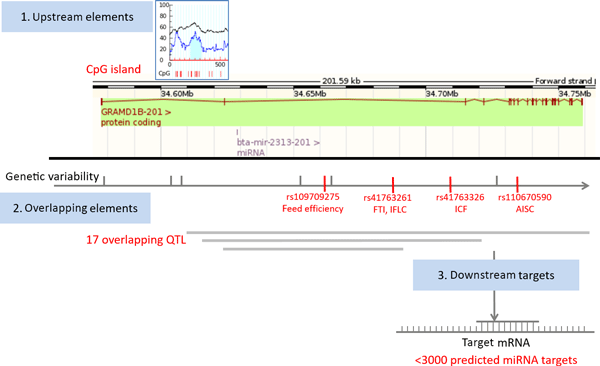 Bta-miR-2313 warrants further functional analysis since it overlaps with several QTL, has over 3100 predicted targets, and is located within GRAMD1B, associated with production traits in cattle. ACADSB is a member of the acyl-CoA dehydrogenase family, which can catalyze the dehydrogenation of acyl-CoA derivatives in lipometabolism. Our previous transcriptome analysis results identified it as a differentially expressed gene in mammary tissue between low and high milk fat cattle. Current results showed that ACADSB expression level was positively correlated with cellular triglycerides content, and it was actively involved in fatty acid metabolism pathway in BME cell of dairy cattle. The androgen receptor (AR) plays the vital role of a bridge on the function of the androgen and has sexual size dimorphism. For this reason, the objective of this study was to explore the novel indel variants within the cattle AR gene and to detect a novel 24 bp indel within the AR gene. It significantly affected growth traits, suggesting that this indel may be a useful DNA marker for the elimination or selection of excellent individuals for cattle breeding. We investigated the expression profile and polymorphism of bovine PPARD as well as their association with growth traits in Chinese cattle. Association analysis suggested that individuals with the GAAGTT combined genotype of three SNPs detected showed optimal values in all the growth traits analyzed. These results revealed that the GAAGTT combined genotype of three SNPs detected in the bovine PPARD gene was a significant potential genetic marker for marker-assisted selection in Chinese cattle. This work identified SNPs in the growth- and development-related ATBF1 gene in cattle. Five novel SNPs were found in 644 cattle. The results found that SNP1, SNP2, and SNP3 and the combined genotypes SNP1–SNP3, SNP1–SNP4 and SNP2–SNP5 were significantly associated with growth traits in Qinchuan and Jinnan cattle. These findings indicate that the bovine ATBF1 gene has marked effects on growth traits, and the growth-trait-related loci can be used as DNA markers for MAS breeding programs in cattle. Bovine mastitis, a prevalent and complex infectious disease, can result in significant dairy cattle losses. MicroRNAs (miRNAs) play important roles in regulating innate and adaptive immune responses. The results in this paper show that the expression of miR-144-5p and miR-130b-5p in mastitis-infected mammary tissue was significantly downregulated and upregulated, respectively, compared to healthy tissue. Our findings may provide a method for the treatment of mastitis. The main contribution of our paper is the identification of several SNPs of the SIRT1 gene in beef cattle and their relationships to carcass traits such as weight and meat percentage. We believe that this contribution is theoretically and practically relevant because beef cattle are bred to maximize carcass quality, but traits that lead to carcass quality are difficult to assess in vivo. We provide a method to select individuals for breeding based on genetic propensity for meat production. Paired box 7 (Pax7) gene, a member of the paired box gene family, plays a critical role in animal growth and muscle development, especially in cell proliferation and self-renewal. In our study, the 10 bp duplication indel was detected in the promoter region within bovine Pax7 gene as well as its association with growth traits. This indel was significantly associated with the body weight in Xianan cattle, the body height in Jinjiang cattle, and the hip width in Pi'nan cattle. Prosaposin (PSAP) is involved in muscle development and as a candidate gene in economic traits of cattle. Six novel SNPs of PSAP were identified and 47 traits in beef cattle measured. Association analysis revealed I10-65G > A, I10-162C > T, and E11-93C > G were significantly associated with carcass composition traits. Individuals with GCCCGC and ACCTCC haplotypes showed higher dressed weight, backfat thickness, and rib eye area, thus suggesting a genetic influence on cattle carcass composition. Nanog is an important pluripotent transcription regulator, and its overexpression leads to a high expression of the growth and differentiation factor 3, affecting animal growth traits. The aim of this study was to explore the genetic variations within the Nanog gene and their effects on phenotypic traits in cattle. Six novel exonic single nucleotide polymorphisms were found in six cattle breeds and indicated that Nanog could be a candidate gene for marker-assisted selection in cattle breeding. SMAD3 plays essential roles in myogenesis and osteogenesis and may relate to the regulation of body weight. In this study, a 17 bp indel in intron3 of the SMAD3 gene was detected in four Chinese cattle breeds (Qinchuan, Jiaxian, Nanyang and Caoyuan) by using DNA pool sequencing, and it was significantly associated with gene expression and growth traits of Qinchuan and Caoyuan cattle. This indel could be could be a promising marker for beef cattle breeding. In this research, the effects of two indel loci of the visfatin gene on mRNA expression levels were studied. The results imply that the expression levels of bovine visfatin vary with age and its indels might be putative variants mediating the expression of the bovine visfatin gene. This study provides useful information for further functional studies of bovine visfatin.